Archive addition number 600! thought I would give it to Weep with this cool ‘below the coping’ Jeff Roenning waiting for a go…at Tom Groholski’s. This entry was posted in DJ KING WEEP, Groholski's Ramp, Jeff Roenning, photos by Jeff Roenning, Tom Groholski, Weeps and tagged below the cope, chris blank, groholski ramp, rolling in, tom gorholski, Weep on June 30, 2010 by jasonoliva. This entry was posted in DJ KING WEEP and tagged ART, backyard ramps, boards, DJ KING WEEP, east coast, house of steam, jason, Jason oliva, jasonoliva, New Jersey, New York City, oliva, paintings, photography, pool Skating, ramp, ride, sk8, sk8t, skate, skate decks, skate history, skate photography, Skate ramps, skate trucks, skate wheels, skateboarding, skateboarding history, skateboarding photography, skateboards, skatepark, skater, SKATERS, steam, Street Skating, TEAM STEAM, The Barn, The House of Steam, thos, vert, vert ramps, Vert Skating, Weep on November 22, 2009 by jasonoliva. Weepee right in the middle of it head and shoulders above the rest, rockin the JG Tee and the Barfoot ride…G.O.A.T. Yo!! Jay Henry Layback air, Ben Cornish(Sportin a Craig Johnson), Chris”Weep” Blank, Steve Mannion(Overkill Sticker! Possible Tommy G hand me down Gator, Rick Holtzman, A Deitz Brutha (Stripey Socks)…Who is watching from the flat? Yar Weep, remember that time we….. maaan that was dope. Drop some love comments all! 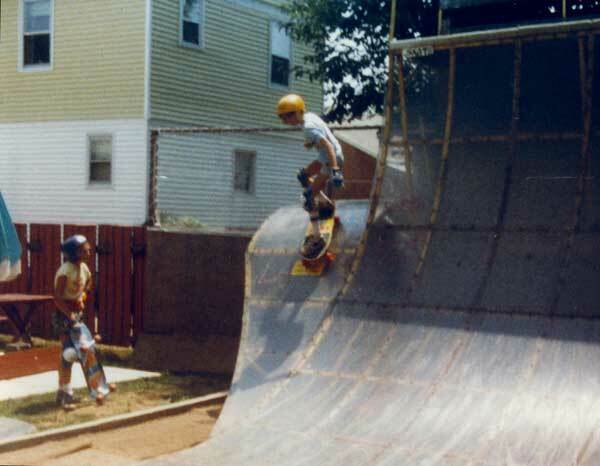 This entry was posted in 1984, 1985, 1986, Ben Cornish, DJ KING WEEP, Jay Henry, Jeff Roenning, Photos by Ken & Steven Deitz, TEAM STEAM, The Barn, The Barn’s History and tagged ART, backyard ramps, boards, DJ KING WEEP, dj vert-one, east coast, four4, house of steam, jason, Jason oliva, jasonoliva, New Jersey, New York City, Night Session, NYC, oliva, paintings, photography, pool Skating, ramp, ride, Rocky Vertone, Rodney Smith, SHUT, sk8, sk8t, skate, skate decks, skate history, skate photography, Skate ramps, skate trucks, skate wheels, skateboarding, skateboarding history, skateboarding photography, skateboards, skatepark, skater, steam, Street Skating, team, TEAM STEAM, The Barn, The House of Steam, thos, vert, vert ramps, Vert Skating, Weep, weepee, Weeps, weepstar, youtube skate on May 21, 2009 by jasonoliva. 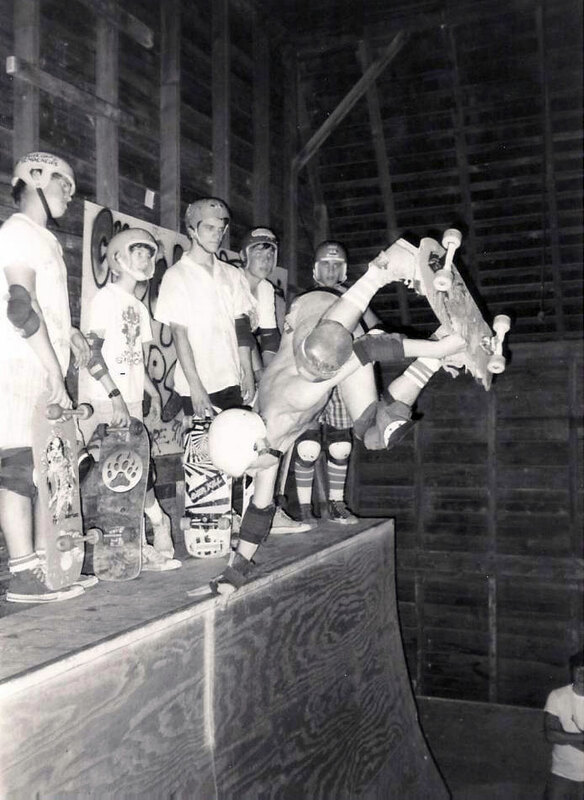 349: Rob Roskopp Sadplant at the Barn 1986? Weepy and Jeff Roenning on the deck. Rob Roskopp Sad Plant The Barn circa 1986? The fish eye lense used in taking this photo makes the Barn look alot more spacious then it was..there was no Tardis effect in reality The Barn looked big from the outside and small on the inside. The Barn defied a lot of things but the physics of spatial relations was not one of them. There is Weep peaking his head around Jeff’s shoulder on the deck. Anyone know who the third skater was? 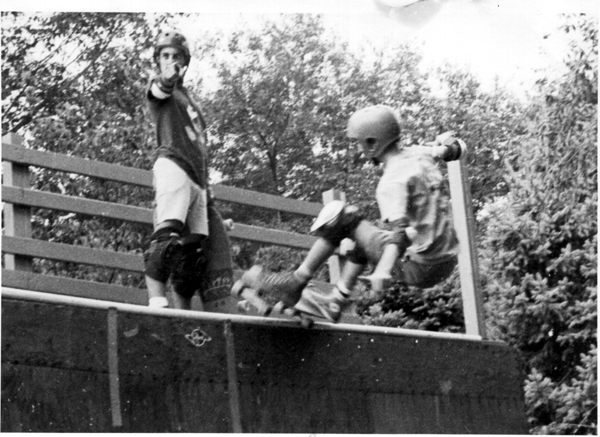 This entry was posted in 1986, DJ KING WEEP, Jeff Roenning, photos by Jeff Roenning, Rob Roskopp, Roening’s Ramp, Roenning’s Hillcrest Ramp, Roenning’s Mt. Ave Ramp, The Barn, Weeps and tagged ART, backyard ramps, boards, DJ KING WEEP, east coast, house of steam, jason, Jason oliva, jasonoliva, Jeff Roenning, New Jersey, New York City, oliva, paintings, photography, pool Skating, ramp, ride, Rob Roskopp, sk8, sk8t, skate, skate decks, skate history, skate photography, Skate ramps, skate trucks, skate wheels, skateboarding, skateboarding history, skateboarding photography, skateboards, skatepark, skater, SKATERS, steam, Street Skating, TEAM STEAM, The Barn, The House of Steam, thos, vert, vert ramps, Vert Skating, Weep on January 15, 2009 by jasonoliva.